“La moerte avla por mi boka,” wrote Marcel Cohen in his 1981 memoir, In Search of a Lost Ladino. “Death speaks through my mouth.” The centuries-old Sephardic vernacular is a tool of communication with the dead, meaningful both in its orality and in its silence. It is apt that the Mexican writer Myriam Moscona quotes that passage early in her literary-fantasy-memoir, Tela de sevoya (Onioncloth). Born in Mexico City to Bulgarian-born Sephardic Jews, Moscona traces her ancestry to the Iberian Peninsula until the expulsions of Jews and Muslims beginning in the 14th century (Mexico City’s newest mayor, Claudia Sheinbaum Pardo, also has Bulgarian Sephardic roots). She is perhaps best known internationally for her award-winning poetry—such as Ivory Black (translated by Jen Hofer for Les Figues Press), which received the PEN Award for Poetry in Translation—and as a journalist and prose writer whose works have been translated into ten languages. Her most recent work, Tela de sevoya, is a palimpsestic, genre-bending text woven throughout—like the titular onioncloth—with the voices of the dead, dying, and their living conduits. Part roots tourism, part scholarly interlude, part autobiography, and part dreamscape, what Moscona has produced is an artistic statement outlining the many deaths and afterlives of her personal, familial, communal, and cultural past, mediated by the central character of the Ladino language and her own psyche. Like most Jews living in the Balkans prior to the Holocaust, alongside smaller groups of Jews in Morocco, Egypt, and Palestine, Moscona’s parents grew up speaking Ladino, also known as Judeo-Spanish or Judezmo. Rooted in the various regional dialects spoken by Jews in pre-expulsion Iberia, Ladino developed into a full-fledged literary, liturgical, and spoken language in the centuries following the expulsion of 1492, with important centers scattered throughout their Mediterranean diaspora. Sephardic Jews’ dispersal and interconnected networks of trade, kinship, and publishing contributed to the language’s French, Italian, Portuguese, Greek, Turkish, Arabic, and Slavic influences. Only after the extermination of large numbers of Ladino-speakers in the Holocaust (although Bulgarian-born Jews were spared the worst) and language assimilation in Western Europe, North and South America, and Palestine-Israel did Ladino enter a period of rapid decline. With the passing of the last generation of mostly elderly native and semi-native speakers, Ladino will likely move from endangered to extinct. Like many other contemporary literary works on the subject, Moscona’s reads as much as a eulogy as it does a journey of self-discovery. 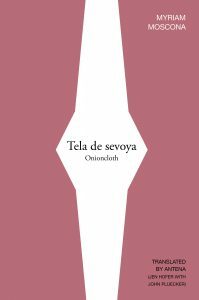 Tela de sevoya, or Onioncloth, was recently published in the United States by Les Figues Press and translated by Antena (Jen Hofer with John Pluecker), a language justice and cultural advocacy organization. These Los Angeles-based groups, in taking up Moscona’s work, engage in the precarious task of rendering into English a complex text about and conceived in the textual interplay of modern literary Spanish and her parents’ Ladino. Any translation entails a loss. This becomes painfully clear to readers of the English. In the original, Tela de Sevoya transitions between standard Spanish and an italicized, orthographically distinct Ladino, usually provided without translation—leaving to the Hispanophone readers the task of adjusting and translating themselves. The English, however, requires a subsequent translation of the Ladino that both diminishes the disjunction between languages and further distances the Ladino passages from the rest of the (English) narrative. Translation, however, is not merely a side-effect but constitutive of Moscona’s larger goals, and thus Hofer and Pluecker’s efforts are to be highly commended for their tightrope-balancing. Moscona’s attempts to recreate her personal past through memory recollection, to express and interpret her dreams, to build narratives based on family history, and to explore her troubled relationships with her grandmother and parents all involve some kind of effort at translation. Tela de Sevoya aims to render in the same—or at least similar—language(s) the many stories that make up the narrator’s history, and Moscona understands that the interplay between an immediately intelligible modern Spanish and an archaic, strange, but deeply familiar Ladino is an incredibly rich tool to “join myself together.” The links are made clear when Moscona writes that “the only form of translation to which memory has access is language.” In other words, language—Ladino—is the only means by which she translates her and her family’s memories into the present. But translation is never seamless and rarely absent of the traces of the original. The rips in the seams of translations and the lingering after-images of originals also allow Moscona to address the immense sense of loss and death that translation indicates. The dialogue between the narrator’s Spanish and her grandmother Victoria’s Ladino—a central and troubled relationship in the narrative—is made all the more intense given the partial intelligibility of the two. This rift speaks to the larger break between the narrator and her past and family, as manifested through the rift between Ladino and Spanish. And this linguistic gap is exacerbated by a generational one between a native-born child and the elderly immigrant grandmother, provoking the latter to lay shame and guilt onto the young Moscona figure, as rendered through their Spanish-Ladino arguments. The memories are only glimpsed and grasped imperfectly and incompletely, impossible to recover but too familiar to fully abandon. Ladino becomes the ever-dying, ever-present protagonist and antagonist of Moscona’s story, bringing the dead back to life alongside their traumas. Moscona’s use of Ladino puts her in the company of a handful of contemporary Latin American writers who play with shifts between modern Spanish and Ladino, using those linguistic ruptures to explore personal and ancestral pasts and cultural and historical loss. That technique mirrors the novella’s path through the familiarity of strangeness—Ladino as a Spanish marked by an accreted history in the Mediterranean, Balkans, and Middle East runs into Moscona’s contemporary Mexican Spanish. The strangeness is rendered global, locating Ladino in Mexico and in Bulgaria—but never in its Iberian roots—and restricting Moscona’s temporal scope only to the relatively recent past. Unlike other recently published novels like Yaa Gyasi’s Homegoing (2016), which is based on the interwoven narratives of several generations of a single family between Africa’s Gold Coast and North America, Moscona misses an opportunity to more fully explore the vast ancestral pool of potential and evocative Sephardic narratives beyond her family’s immediate past. Despite her references and attempts to incorporate medieval Jewish histories, these tend to feel like afterthoughts and footnotes. These disjunctures are put into even greater relief when Tela de sevoya cycles through its different types of chapters: “Focal Length” explores episodes from the narrator’s past; “Windmill” unfurls in esoteric and abstract dreamlike landscapes; “From the Travel Diary” draws from Moscona’s travels in Bulgaria, Greece, Turkey, Israel, and Spain; “Paperweight” supplies historical and scholarly background; “Kantikas” reproduces Ladino songs; and “The Fourth Wall” allows the text to speak from familial voices beyond the narrator’s. No discernable or linear narrative ties the chapters together, and at times the division of the text into these sections forces the reader to stumble and readjust to the tone and style of the next chapter. This uneven, perhaps even messy, organization recalls a disjointed stream-of-consciousness journey through one author’s journey into the past, memory, and dreams—indeed, Moscona does not fail to reference Proust, Jung, and Benjamin. In many ways the reader is brought along to explore, without direction, the many byzantine channels and well-worn pathways laid out by Moscona and the narrator, with nothing but the sound of Ladino as a guide. Among the recurring episodes of Tela de Sevoya are its dreamlike sequences, arguably the most perplexing and challenging parts of the text. Though never explicitly acknowledged as the narrator’s or Moscona’s dreams, these passages tend to embody the confusion and fantasy of the text’s waking world. These dreams make clear, in otherwise unclear scenarios, what the text’s journey into one’s family and cultural past might be about. But, like any dream, its idiosyncrasies may only be intelligible to the dreamer herself, if even that. One particular instance, set in a circus, invokes bestial violence and the presence and disappearance of the narrator’s father and grandmother. The carnival barker announces in Ladino that “we cannot escape our destinies, we are all dead, girls, boys, tamers, beasts. All dead.” The idea of imaginary danger—of beasts or family members—implied here is one that is in fact already dead and dreamt up. Readers might recall one of the possible namesakes of these sections’ titles, “Windmills,” as coming from Cervantes’ Don Quixote, whose titular character mistook windmills in the distance for hulking giants. Moscona, too, realizes that even the innocuous or dead can inspire fear and intimidation. With the murder of upwards of 50,000 Ladino-speakers in the Holocaust, widespread language assimilation in the Americas, Palestine-Israel, and Western Europe, and the marginalization of Sephardic cultures in mainstream Jewish life, Ladino has never stood on such precarious ground as it does today. Yet the death of Ladino, affirmed in different ways by interviews and background research featured in sections of the book, does not seem to be resisted by Moscona in any substantive way other than writing part of her book, and some of her poetry found elsewhere, in Ladino. It would be a mistake to assume that Tela de Sevoya, or Moscona’s career in general, is meant to revive the language in any way other than as a personally resonant referent. Ladino is also not an end in itself, but a prism for a much wider array of themes and subjects with which Moscona is much more interested. As I see it—and as the text sometimes recognizes—Ladino exists (and existed) much more as an oral medium than a literary one, and thus what Moscona accomplishes cannot be called a revival or resuscitation; her approach and use of Ladino in the novel is quite new. Unlike modern Jewish literature in Yiddish or Hebrew, Ladino was seldom employed in Sephardic Jewry’s belles lettres, who instead often opted for French. So Moscona’s Ladino is drastically different than that of her parents or ancestors—its meanings are shaped by the contours of loss, the contentious relationship with her grandmother, by its playful interaction with modern Spanish, and its literary and poetic evocative power. It becomes a language of high culture and nostalgic exploration, no longer a quotidian vernacular. Whereas Ladino was the accessible and common language of Sephardic Jews, used in order to reach the masses through religious instruction or modernizing newspapers, Tela de sevoya transforms the language into a dialect of abstract dreams and memories. This is not your abuelika’s Ladino. Readers may also get a sense that the text is only superficially concerned with the language qua Ladino, despite its central role. The explanatory and historical interludes are composed much more dryly and dispassionately than the rest of the text, and Moscona’s references are either to Western literature or her personal and family pasts. In other words, her Ladino is contextualized within a type of universalism on one hand and individualism on the other, without offering the reader much of a bridge to get from there to a developed affective and literary picture of Ladino. We get no sense of real engagement with the centuries of Sephardic or Ladino literature that Moscona could rightly claim. Source texts like the biblical tales and interpretation of the ubiquitous multi-authored, multi-volume, 18th-century Me’am Loez or the pioneering works of Bosnian-Sephardic dramatist, ethnographer, and proto-feminist Laura Papo Bohoreta are unmined pools relevant to Moscona’s concerns with narrative, history, gender, and family. However, Tela de Sevoya and Moscona’s other works fit into a small wave of post-Holocaust Jewish literature that engages with Ladino, best exemplified in the works of Margalit Matitiahu, Juan Gelman, and Rosa Nissan. In an otherwise beautiful and intimately immersive work, Tela de Sevoya does not seem to give Ladino an independence of its own. To be fair, Moscona’s use of Ladino in her text does not seek to resuscitate or resurrect the language as much as it serves to eulogize the language and its speakers and understand their places in her psyche and inheritance. Ladino is necessary if one wants to understand when “the dead speak to you in languages from before.” A eulogy it may be, but Tela de sevoya is also a testimonial to the incredible afterlives of Ladino and the poetic and literary ways a language can serve as that thin, sieve-like onioncloth through which the living and the dead can communicate. So too does her constant evocation of the lives and deaths of her grandparents and parents—a running theme throughout the novella—represent processes of mourning and acceptance that attempt to reign in unruly and troublesome pasts. In these and many other ways, Tela de sevoya refuses to take the slightest glimpse at any future. But this refusal to look ahead is what makes the book as moving and powerful as it is. Max Modiano Daniel is a History PhD student at UCLA, currently working on his dissertation about how 20th century Los Angeles gave rise to emerging transnational, pan-ethnic, and culturally syncretic Sephardic Jewish communities. Jen Hofer is an LA-based poet, translator, social justice interpreter, teacher, knitter, book-maker, public letter-writer, urban cyclist, and co-founder of the language justice and language experimentation collaborative Antena and the language justice advocacy collective Antena Los Ángeles. She has published 10 books in translation, 3 books of poetry, and numerous homemade books in DIY editions. John Pluecker is a language worker who writes, translates, organizes, interprets, and creates. In 2010, he co-founded the collaborative Antena and in 2015 the social justice interpreting collective Antena Houston. His most recent translations from the Spanish include Gore Capitalism and Antígona González. His book of poetry and image, Ford Over, was released in 2016 from Noemi Press.